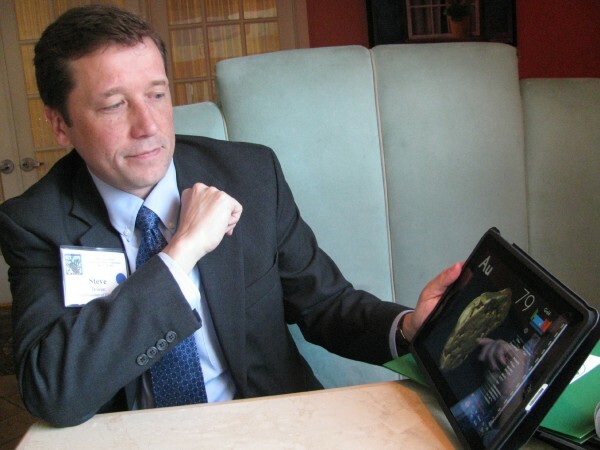 Stephen Bowen, the commissioner of the Maine Department of Education, displays an iPad science app during a conference in Augusta in 2011. AUGUSTA, Maine — Maine Education Commissioner Stephen Bowen announced Friday that he will resign effective Sept. 12 to take a job with the national Council of Chief State School Officers, according to a statement from Gov. Paul LePage. Bowen, who was appointed by LePage in March 2011, has been at the center of the governor’s ambitious and sometimes controversial education reform agenda, though even some of his most virulent policy opponents said he did his job with grace. Starting next month, Bowen will be the organization’s strategic initiative director of innovation and oversee its Innovation Lab Network. That means he’ll travel the country to collect and share education reform initiatives. Bowen told the Bangor Daily News on Friday afternoon that he told members of the administration of his impending departure on Wednesday and met personally with LePage on Friday morning. Bowen, a former state legislator and LePage transition team adviser who lives in Rockport, will be based in Maine for his new position but will travel throughout the U.S. on behalf of the Washington, D.C.-based organization. Bowen has led a range of education reforms under LePage, including the passage of Maine’s first-ever law allowing charter schools, an A-through-F public school grading system, a proficiency-based diploma that ensures high school students will be college or career ready upon graduation and a system of teacher and school administrator accountability, among others. Under Bowen, the Maine Department of Education was also successful recently in securing a flexibility agreement with the U.S. Department of Education around the former No Child Left Behind Act. The agreement allows struggling Maine schools to implement improvement measures without having to meet the stringent NCLB requirement that 100 percent of students be proficient in reading and math by 2014. Bowen said the Council of Chief State School Officers has been involved in Maine education policy for years and contributed significantly to the state’s NCLB waiver application. The council also has other Maine connections: Former Education Commission Susan Gendron, who served under Gov. John Baldacci, is listed as a consultant for the organization. A close LePage ally, recently ousted Florida Education Commissioner Tony Bennett, who delivered the keynote address at an education reform conference hosted by LePage in March, serves on the organization’s board. Bowen said Bennett was not involved in his hiring. But not everything Bowen championed became law, such as efforts to create open school choice in Maine, a bid to lift the 10-school cap on the number of charter schools that can be created within the next decade and an initiative to route some public funding to religious school. LePage, who has long made similar statements of his own, said in a prepared statement that Bowen will be missed. The administration will name an acting commissioner in the coming weeks as Bowen works with other DOE officials to ensure a smooth transition. Adrienne Bennett, a spokeswoman for LePage, would not speculate on the governor’s timeline, nor whether the fact that LePage’s first term in office ends with next year’s election would complicate the search. Connie Brown, executive director of the Maine School Management Association, has often found herself opposed to Bowen on policy initiatives, but said he carried out those debates with respect and dignity. Brown said that if Bowen had any weaknesses at the time of his hiring — he was an education policy analyst for the conservative Maine Heritage Policy Center — it was that he had no administrative experience and had not been a superintendent. Bowen acknowledged that and said it was one of the chief challenges of his tenure. The Council of Chief State School Officers is a nationwide, nonpartisan and nonprofit membership organization that helps education chiefs in all states implement reforms that prepare students for life after public school. Chris Minnich, the organization’s executive director, said he was “thrilled” that Bowen took the job.